We’re very proud to announce the first day of our two day event in Seattle. 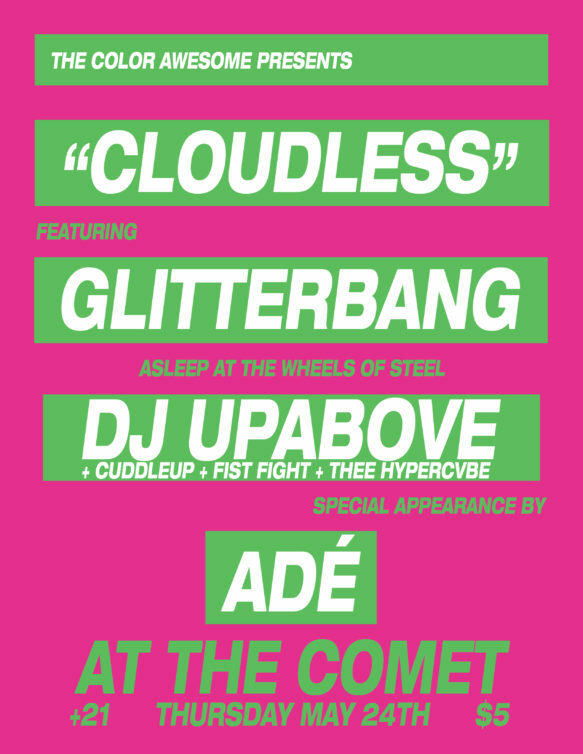 Seattle’s sexiest, sassiest, chanteuse, ADÉ, will be joining us for a few numbers and the boy/girl duo, Glitterbang will be playing a full set. Throw in a few guest DJ’s, including some of the performers from night two of CLOUDLESS, and some crazy visuals, and we have ourselves a queer party which EVERYONE is welcome to! If you are planning on attending the event, we have a Kickstarter page where you can grab admission for both nights. At the $25 dollar level, you will also receive our gratitude, along with a private password to a COLORCAST which Phil will prepare for BACKERS ONLY. In addition to admission for both nights, you’ll have complete access to downloadable, super hi-res images from the event, all taken by Paige. Check out the other rewards at other levels, they’re kind of amazing!! Wazhma Samizay, David Zinn, Thorley Papay, Nathan Clark, Todd Arkley, Corey Gutch, Layne Shepherd, Catherine Ciesla, John Campos, Jane Manning, Michael Ellsworth, Carolyn, Holly, Leticia Britos Cavagnaro, Caroline Simard, Christine URen, wendyjustus, Emma, and Peter. We know some of them, others, we are surprised and thrilled by, all of them are awesome. To see our progress, check out the widget to your right. I guess these sorts of campaigns can get a little “guilt trippy” sometimes. We don’t want that! So here’s the quick version; every one dollar will help us to our goal. Our regular readers have HAD to take away invaluable amounts of music and information from The Color Awesome, especially Paige’s hard work on the weekly Sirius XM Download 15 pages. Do you think that that, plus future endeavors from The Color Awesome are worth a buck? How about two, or 25? Here’s the link to Kickstarter, if you would like to help out. We appreciate our readers and those who have backed our project so far very, very much, THANKS!!! An Open Letter To The Pet Shop Boys or How Can You Expect To Be Taken Seriously?